Rebondissement dans l’Affaire de la tuerie de Christchurch. La Mosquée de Christchurch était un Centre de Recrutement d’Al Qaeda au Yémen qui a mené les Attentats contre Charlie Hebdo. Il paraissait étrange que les médias et journalistes soient plus que silencieux sur cette affaire. Nous nous attendions à un déferlement d’invectives contre l’Extrême Droite et au lieu de cela, silence total. Et c’est ce lourd silence qui a conduit des sites de réinformation à mener des investigations scrupuleuses. Et les investigations menées sont lourdes de sens et expliquent le silence de l’ensemble des médias. La Mosquée de Chrischurch est donc une base qui a servi à la Tuerie Mortelle de Charlie Hebdo. DESERT STORM: Graffiti on a wall in Yemen protests drone strikes. 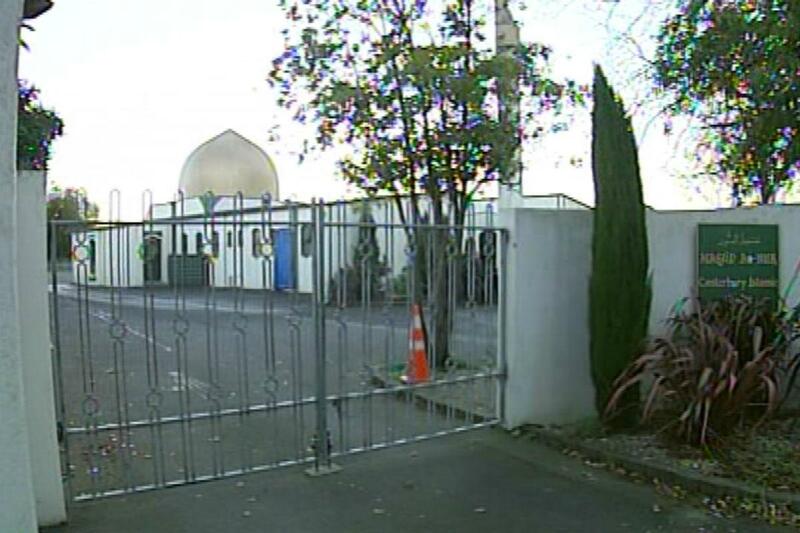 CHRISTCHURCH BASE: Al-Noor mosque where Daryl Jones attended. When the Jones boys converted to Islam, it caused quite a stir in Christchurch. Suddenly Daryl and his younger brother Nathan, who grew up in a strong Christian house, were sporting beards, learning Arabic and wearing flowing robes. Carloads of Muslims, including immigrant women in veils, would turn up at the family’s home in a smart east Christchurch suburb, neighbours tut-tutting and muttering about terrorists. Some who knew the family accepted the conversion, others struggled. When Daryl was in his early 20s and still flirting with Islam, he surprised the family of a Christian friend he was visiting when he suddenly declared he had to go to the far end of the house to pray towards Mecca. « We thought it was weird, » said the friend’s mother. All of this upset the boys’ parents – the father a former Australian police officer doing security for a government organisation, the mother employed by a Christchurch tertiary institution. The Sunday Star-Times has decided not to name the parents to protect their privacy. They declined interviews and have told friends not to speak to the media. Daryl, 30 when he died, moved to Sydney around 2008 and converted to Islam soon after arriving. Nathan, still in Christchurch, converted soon after with the help of Saudi Arabian students he was friendly with. « The parents desperately wanted both the boys to leave Islam. They had seen their sons change dramatically in appearance – it’s scary for parents when that happens, » a source said. Mr and Mrs Jones turned to their New Life Church for help, and were put in touch with some people with knowledge of Islam to teach them more about it and hopefully convince Nathan to re-think his decision. He listened politely to the delegation, but rejected the advice. He changed his name to Muslim bin John, married a Somali woman and around 2009 headed to Saudi Arabia and then Yemen, ancestral home of Osama bin Laden and home base of al-Qaeda in the Arabian Peninsula (AQAP). He told his family he wanted to teach English and help people. But a source said Jones was thrown in prison in Yemen because he was not a registered teacher, leaving his wife and four children stranded. His parents arranged for the family to come to Christchurch, where they remain. The family last heard from Daryl around May 2012, then lost all contact. The strain on his parents’ marriage was immense, and they separated. After the 2011 earthquakes Mrs Jones spent time in a motor home, staying at a caravan park near Christchurch. She gave the impression of a lost soul, said those who knew her. Residents of the park remember her saying her son was « missing » in the Middle East and she had asked church groups to help find him. She seemed very depressed and had had some sort of falling out with her daughter-in-law. When news of Daryl’s death finally filtered through after DNA was used to identify the remains, Mrs Jones fell apart. Born in Australia on September 14, 1983, Daryl Anthony Jones and his family moved to New Zealand, his mother’s home country, when he was about six or seven. Those who knew Jones used the same words to describe him: quiet, shy, soft-spoken, gentle, polite. Daryl and Nathan attended Aranui High School and were involved in Christian youth groups, but became disillusioned and didn’t fit in. Sensitive and deep thinkers, they believed there was hypocrisy in the church. « They felt that what was being taught about love and acceptance was not being practised, » a source said. « Daryl was looking for a belief system that worked for him. Muslim friends offered brotherhood if he converted to Islam. » One issue for Daryl was the Christian doctrine of the Holy Trinity. « Daryl accepted the [Islamic] view of one absolute God, » the source said. Experts familiar with Islamic converts said there was usually some problem or crisis in their background. Although Daryl was from a good family, sources said the father was angry and controlling. « Daryl was a very quiet man, very serious. I would say he had an anger issue deep down, » said a person who knew the family. Fish said he heard Jones had moved to an Arab country where he was studying the Koran « or something like that. Australian media reported Jones was known to Australian Federal Police (AFP) as an « Islamic radical » and the subject of numerous border protection reports. He and Havard had their Australian passports cancelled in 2012 because it was feared they posed a threat to national security. Jones and Havard were with five others in the convoy hit by a missile fired from a US drone in Yemen’s Hadramout province on November 19. While authorities believe they were « foot soldiers » of AQAP, they were not the main target of the attack. Jones’ presence in the convoy remains a mystery to his heartbroken family, who have to face the fact their boy is buried in the sands of Yemen. Prime Minister John Key, minister in charge of the SIS, has remained tight-lipped about the case, initially refusing to release his real name until it was reported in Australian media. He said the Government Communications Security Bureau (GCSB) didn’t supply information that led directly to Jones’ death, but had a warrant to monitor him and passed information to Five Eyes security agency partners. Key said drone strikes were justified, even when innocent civilians were mistakenly killed. The Star-Times sought information on Jones from the Department of Internal Affairs (DIA) and the Ministry of Foreign Affairs and Trade. DIA confirmed it held passport information on him but refused to release details on privacy and national security grounds. MFAT said: « The family has requested privacy and we won’t be commenting. » A senior DIA source said pressure was exerted from the Prime Minister’s office not to release information. Friends of the family say they suddenly went quiet a couple of months ago, and speculated the Government had advised them not to speak. On Friday afternoons, Muslim converts gather at a drop-in centre in suburban Christchurch to chat and teach anyone who’s interested about Islam. They have taken names like Abu Hamzah and Abdul Hakeem. One has kept his old name – Nathan Jones. He is the younger brother of Daryl Jones, also known as Muslim bin John, killed by an American drone last year. Nathan Jones and his friends set up the centre to promote Salafism, a sect which follows strict Islam as practised in Mohammed’s time. Some Salafi followers in Western countries espouse jihad but Jones and his friends denounce violence. Flyers in the window proclaim that « terrorists kill Muslims and non-Muslims indiscriminately ». Hamzah said Havard and Jones listened to radical preachers like Anwar al-Awlaki and were « overcome by emotions » over the killing of Muslims. « We feel pain for our Muslim brothers and we ask almighty Lord to change the situation but we do it based on morals and knowledge. If we did it based on emotions we’d probably be there [Yemen] too. A Christchurch mosque has been linked to the drone killing of New Zealand al-Qaida suspect Daryl Jones. His parents, Neill and Bronwyn Dowrick, say their son told them he was first taught radical Islam at the Al Noor mosque in Addington. Mr Havard moved from Australia to New Zealand in 2010. He’s remembered at the mosque by the name of Saleem Khattab. Mr Havard’s parents say it’s at the mosque he met fellow convert Mr Jones, who was known at Muslim Bin John. But the mosque can’t remember Mr Jones, and denies teaching radical Islam. It seems Kiwi spies may have had the mosque under surveillance. « I’m not going to go into the individual entities or the operations that the SIS or the GCSB conducted, » says Prime Minister John Key. Australian Federal Police (AFP) began an investigation into Mr Havard’s possible involvement in an alleged al-Qaida kidnapping of three westerners in Yemen. Documents show, « Mr Havard and Mr Nin John were of long-standing interest to the AFP due to their assessed activities in Yemen liked to al-Qaida ». All that’s known of Mr Jones is that he was 31 years old, a joint New Zealand-Australian citizen, and his family are still here. Les médias de Nouvelle-Zélande avaient donné le détail de l’affaire en 2014. Une mosquée de Christchurch est liée à la mort de Daryl Jones, un membre d’Al Qaeda, suite à une frappe par un drone. Les parents de l’Australien tué aux côtés de Jones ont indiqué que leur fils avait été exposé à l’enseignement de l’islam radical à Christchurch où il a également rencontré M. Jones. Christopher Havard a été tué aux côtés de M. Jones par un drone US au Yémen l’année dernière. Ses parents, Neill et Bronwyn Dowrick, ont déclaré que leur fils leur a dit qu’il avait d’abord été exposé à l’islam radical à la mosquée Al Noor, à Addington. M. Havard a déménagé d’Australie en Nouvelle-Zélande en 2010. Il était connu à la mosquée sous le nom de Saleem Khattab. Les parents de M. Havard ont déclaré que c’est à la mosquée qu’il a rencontré son ami converti M. Jones qui était connu sous le nom de Muslim Bin John. Il semble que les espions néo-zélandais surveillaient la mosquée. La police fédérale australienne a ouvert une enquête au sujet de la possible implication de M. Havard dans l’enlèvement de trois Occidentaux au Yémen pour le compte d’Al Qaeda. Des documents indiquent que « M. Havard et M. Nin John attiraient depuis longtemps l’attention de la Police Fédérale Australienne en raison de leurs activités connues au Yémen en rapport avec Al Qaeda. Les autoritées Australiennes surveillaient cette mosquée car elle était un centre de recrutement de djihadistes qui étaient formés ensuite pour le terrorisme international. Brenton Tarrant était également informé du but précis qu’avait cette mosquée puisqu’il avait les Noms des personnes Tuées par les djihadistes qui étaient passés dans cette mosquée. Il avait gravé les Noms des Défunts Occidentaux sur ses armes. Combien de Temps faudra t’il attendre pour les Français et les Européens en général soient informés par la presse et les Médias qui cachent volontairement ces vérités en continuant leur propagande Cosmopolite Mortifaire ? L’Eglise Saint Sulpice de Paris incendiée. Pendant que les Synagogues sont surveillées et désormais les mosquées, ce sont les Eglises sans surveillance Aucune que l’on Brûle. FORCE EST DE CONSTATER QUE CELA EST PROBABLEMENT VOULU SINON SOUHAITE. C’est dans l’Eglise Saint Sulpice de Paris que passe Le Méridien de Paris ou la Rose Ligne (Rose Line). Les mesures de la Méridienne de France sont à l’Origine de la Géodésie ainsi que la définition du Mètre. Le Méridien de Paris ou Rose Ligne passe également dans l’Eglise de Rennes-leChâteau dans le département de l’Aude, que Rénova entièrement Feu Abbé Saunière. Ce Méridien traverse donc 2 Eglises en France. C’est pourquoi étaient exposés à Saint Sulpice à Paris le Tableau de Nicolas Poussin « Les Bergers d’Arcadie », « La Crucifiction du Christ » de Signol, le « Saint Antoine Ermite » de David Téniers et le « Sacre du Pape Célestin V » qui avaient pour Fond des paysages de Rennes-le Château. L’Angleterre raflera la Rose Ligne ou Méridien de Paris à la France et imposera son Méridien de Greenwich qui est toujours en vigueur alors que c’est la France qui est à l’Origine, Grâce au Méridien de Paris, de la Définition du Mètre. Henry De Lesquen a du faire un Stage de Citoyenneté au Mémorial de la Shoah. Malgré tous ses défauts, il est vrai qu’Henry De Lesquen s’appuie sur la Science pour parler des Races Humaines. Ses citations sont également toutes sourcées et ses articles ne sont empreint d’aucun antisémitisme. C’est affolant d’en arriver à ce stade. A écouter Absolument.